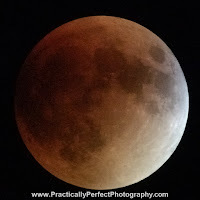 After planning the viewing I did a little research to see if using a telescope was even worthwhile for a lunar eclipse. You might think "duh", but it's not always that clear of an answer. Contrary to what you might think, viewing the full moon in a telescope is actually the worst time to view it. The reason is lighting. If we're talking photographic lighting, this is direct, "front lit", harsh sunlight. This means no shadows on the surface from mountains or craters, so no detail except for the darker colored "seas". The best way to view the moon is when it is side lit, i.e. quarter moon or so. The level of detail you see from a side lit moon is significantly more jaw dropping. The articles I read suggested that using a telescope is a nice way to see it, so I lugged (it's bigger than a child) it out of the basement for cleaning and calibration. I also decided to set up my DSLR on a tripod with my 70-300mm lens to grab some pics too. So is it worthwhile to view a lunar eclipse in a telescope? The answer to the question is YES YES YES! My 8" Donsonian has a focal length of 1200mm (f-stop translates to f/5.9) With the widest eyepiece (25mm), the moon fills MOST of the view and it is awesome. The girls were impressed, the moms were impresses, and I was impressed. We had crystal clear views of he shadows and the color changes, and we could not have gotten a better image anywhere. 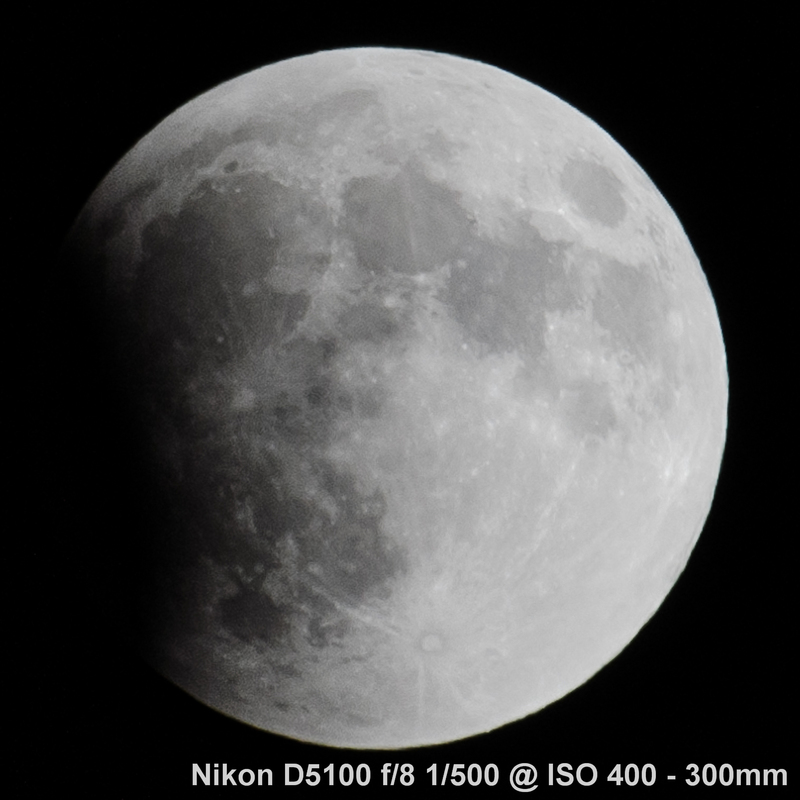 So how did the DSLR fare at a measly 300mm (450mm when you take the crop factor of APS-C sized sensor). Not nearly as well. I have a decent live view, but the image was too bright so focusing through live view, even zoomed, in was not helpful. 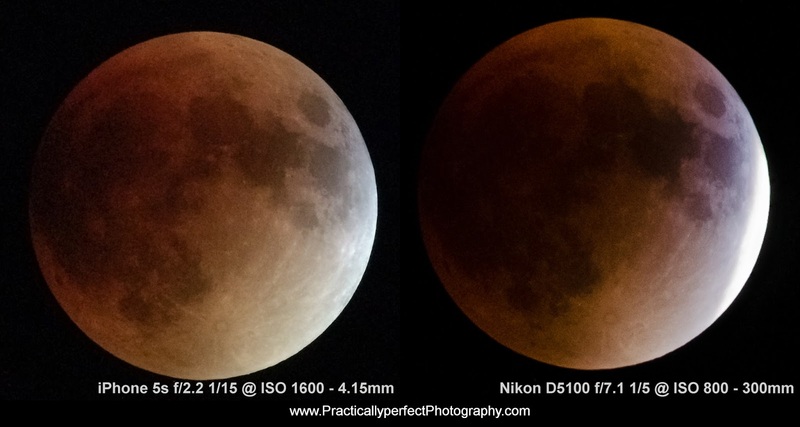 Since this was unplanned I did not read my manual to determine if I could lower the exposure in live view to better see the details (Lesson: Always Read Your Manual!). I did manage to focus using the regular phase detect system by turning off live view, using only the central point, and aiming at the edge of the moon. The moon is so far away that I was easily able to focus then re-mount on the tripod without losing focus, just be careful not to touch the focus ring. 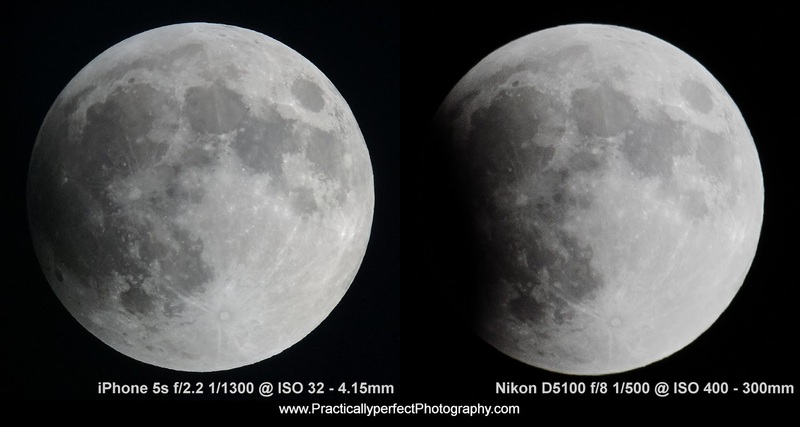 No worries about it being too dim to focus, after all I'm shooting a sunny day (that's what it is on the moon anyway!). I had a lot more freedom with the 300mm lens than the telescope, simply because the field of view was so large. I could leave the camera locked into position for a long time before I had to readjust because the earth's rotation moved the moon out of frame. Naturally, the resulting photos needed to be cropped. I used a steady carbon fiber tripod, remote cable release, and a mirror delay (the only type of mirror lock up available on this particular camera). I also used the eyepiece blocker just in case someone had a flashlight on. Light bouncing in through the viewfinder can end up on your sensor if you have an SLR. This is an experiment you can do at home to see that I'm not fibbing. To get exposure I just guessed. I started at ISO 400, dialed in F/8 since that is sharper on my lens than f/5.6 (which is the largest aperture available at 300mm on this lens). Now I just tried out different shutter speeds until I was happy. In this case I was exposing to the right: using the longest shutter speed I could without blowing out the highlights. Easiest way to check this is to turn on "the blinkies" as one of your playback modes (sometimes called "highlight warning", check your manual for how to turn this on). I also tried to check the histogram, but a small circle in a sea of black does not give a lot of spikes on the graph to really see if you've lost any detail in the bright areas. So I depended on the blinking warning and the visible level of detail (zoomed in to check) to guide my exposures. The whole event took about an hour so there was plenty of time to make adjustments. The pictures from the DSLR weren't great. Due to the low level of magnification, the resulting image is only a few hundred pixels in diameter. Not enough to show great detail or even do much with. You can see the results above. This isn't an apples to apples comparison, it's method A vs. method B. I'm not trying to say the iPhone takes better pictures than a DSLR. I'm only saying the right tool for the job based on what you have available. For the regular "white" shot, I would say the iPhone wins. There's lots of light for both cameras, so the iPhone pixel density shows us it is capable of more detail. For the "blood" shot, iPhone output is much worse than the white shot because it's so much darker so it's up to ISO 1600, but still slightly better than the same shot from the DSLR. I could brighten up the DSLR shot even more, but that just shows lots and lots of noise: nothing to see here. The best method would have been to mount the DSLR onto the telescope. Had I had time I might have done this. The investment is questionable though, because a telescope on an alt-azimuth mount is not the most flexible setup and you would be limited in what you're able to photograph. I would be able to shoot the moon, sun (with the correct filter! ), the larger planets, possibly the Andromeda Galaxy, sections of the Milky Way, and the star cluster Pleiades. What I would not be able to do is shoot fainter objects that require long exposures since the telescope cannot track them to keep them steady on the frame for a long enough period of time. The next time a lunar eclipse does occur in the northern hemisphere (January 20/21 2019), I will decide whether to try to mount the DSLR or just grab a point and shoot with a larger sensor to use so I can shoot through the eyepiece. Either way I'll probably get better pictures for less money than trying to rent a very large camera lens (a 400mm f/2.8 with 2x teleconverter would do the trick on APS-C, but how many hundreds would that cost?). Yes, we could get better shots with more advanced equipment, but I'm not sure the solution to every problem is to throw more money at it. Now we have more than one iPhone 7 in the family, so I am very interested to see what we're capable of capturing next time! I was researching mounting a DSLR to a Dobsonian telescope, but it's not that simple. It appears that frequently the focal point is actually inside the telescope, making modification the only way to make this happen. Let's try an iPhone 7 first, before we go to extremes.